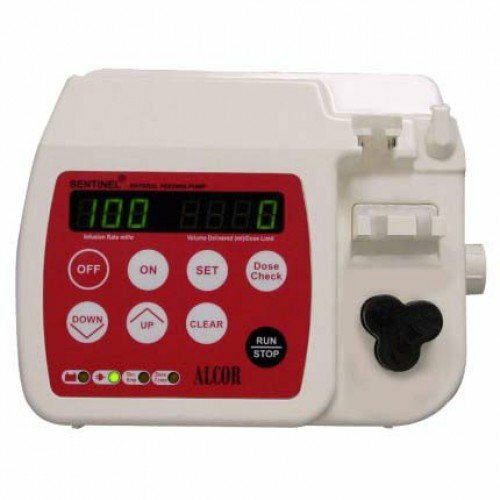 Sentinel Enteral Feeding Pump by Amsino International S-1000-SI is easy-to-use and simple to program eternal feeding pump. It reduces training time and minimizes programming errors. It comes with a large dual display that is clear and easy to read and is equipped with advanced memory, which will not be erased when the unit is powered off. The rotor has a unique shape and it features visual and audible alarms. This enteral feeding pump is reliable, safe, and accurate. Its compact size allows it to easily and conveniently be transported from place to place. It is highly durable, simple to use, and features many quality mechanical parts that ensure that the enteral pump set stay in place. It comes with built-in pole clamps that allow for patient mobility. For convenience, the pump can quickly be loaded with one hand. It has a unique cap holder that prevents contamination of the set on the back of the pump. Dose limits can be programmed in 1ml increments up to 2000mls, then 5ml increments up to 9999ml. The smooth-plastic case is easily cleaned with soap and water or with a sanitizing wipe, such as CaviWipes by Metrex.